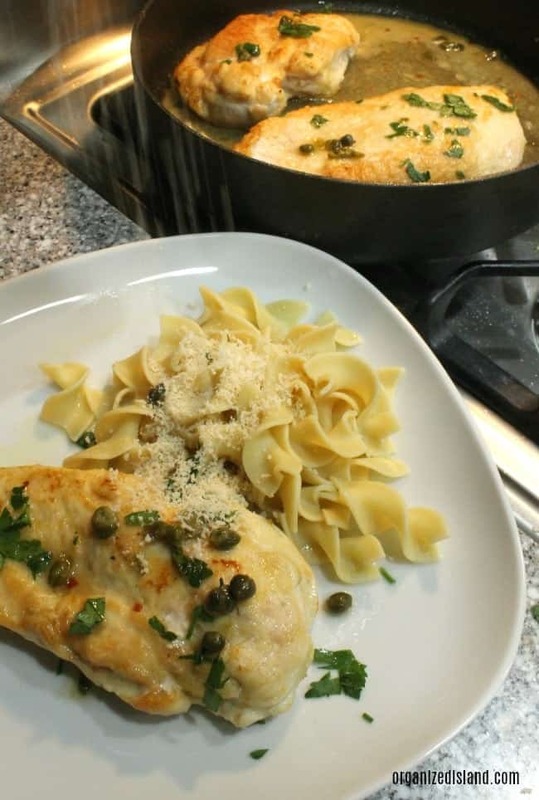 This easy Chicken Piccata recipe with capers comes together in minutes. Happy Monday! 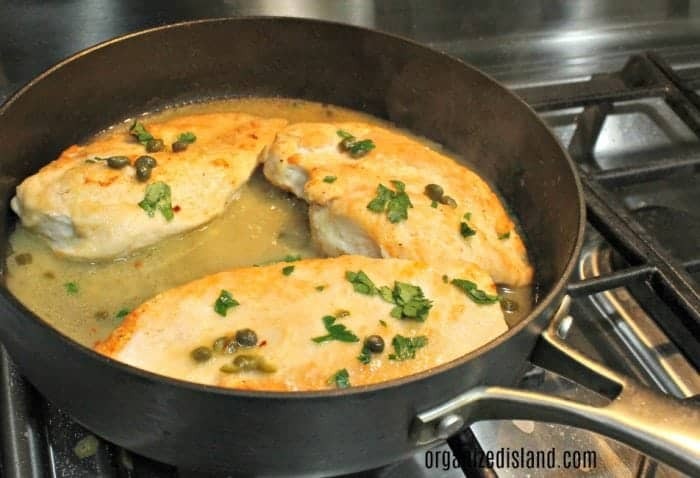 This Easy Chicken Piccata recipe was shared with me at a Bunco session in my former neighborhood. It was such a treat to make and while it looks elegant on the plate, it is really quite simple to make. 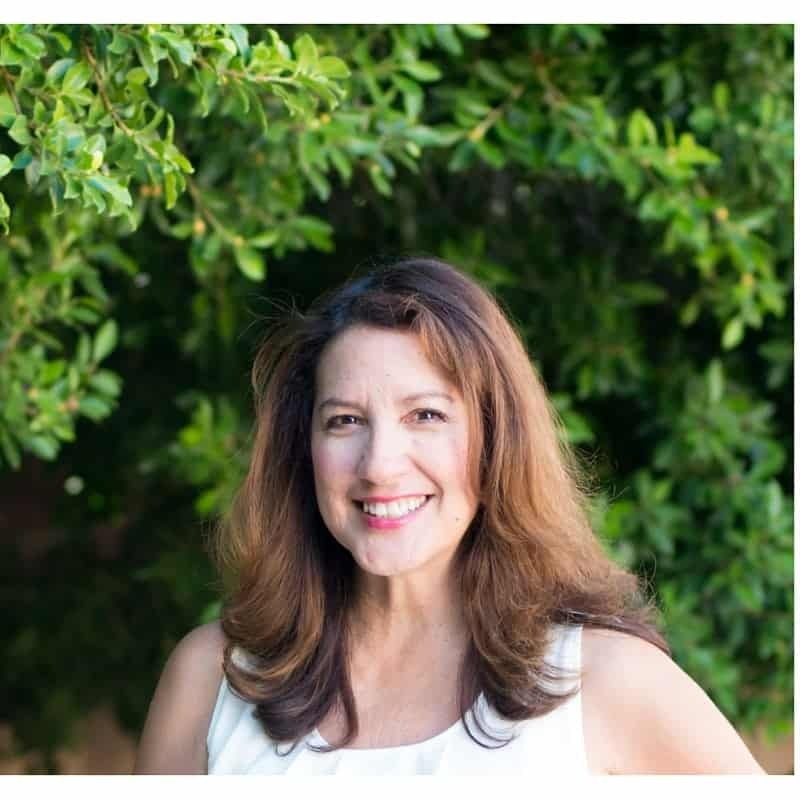 I am missing those Bunco evenings getting together with the neighbors. Those were fun times! Anyhow, this Lemon Chicken Piccata recipe has been modified from the original. I have made the chicken Piccata sauce with a little less lemon, to suit my family’s tastes. It really comes together nicely and is great served with pasta. I like this as an easy weeknight dinner idea. 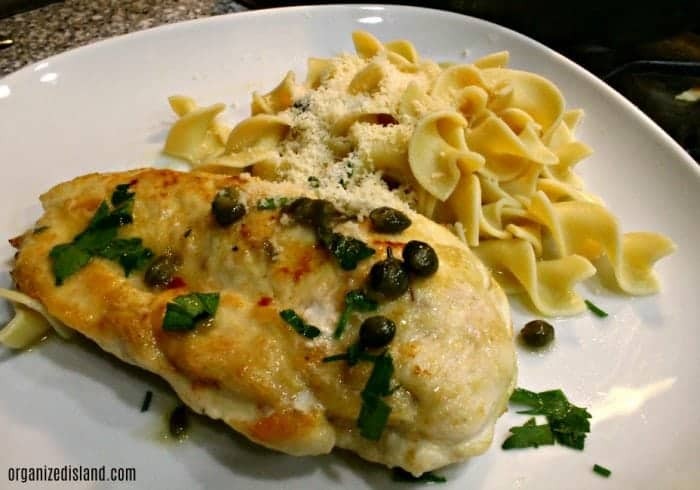 We like our Chicken Piccata with capers, but you can omit them if you like. Chicken Enchiladas Verde – Made with a creamy Chili Verde sauce. Creamy Chicken Pasta with Chipotle Sauce -so easy with a kick of spice! On a plate or shallow pan, mix together flour, salt, pepper. Dredge (coat) chicken in flour mixture, once on each side. Over medium heat, warm 2 tablespoons butter (oil ok)..
Place chicken in pan and brown each side until no longer pink in center (4-6 minutes). 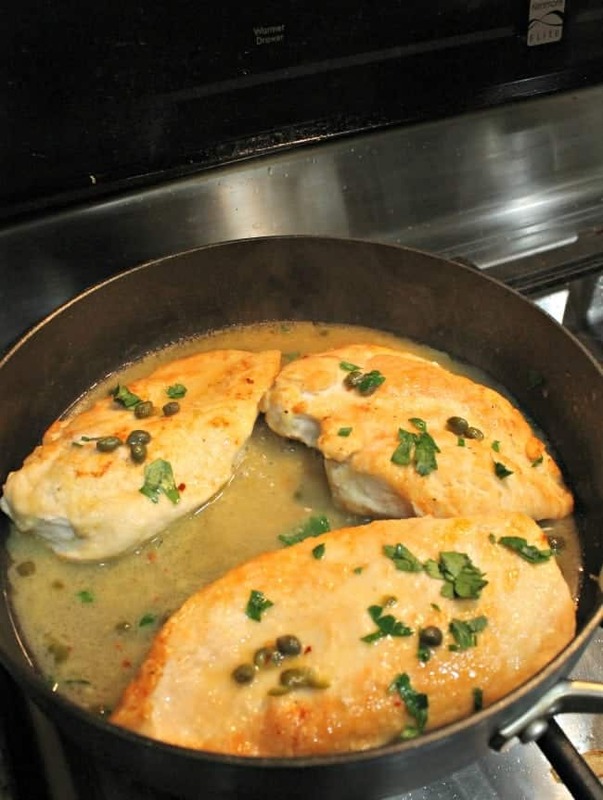 In skillet over medium-low heat add 1 tablespoon butter,wine, lemon juice, garlic and capers. Smash capers to release flavor and scrap bits from bottom of chicken pan. Return chicken breasts to the pan, add the chopped parsley and cook until heated through. Add chicken to skillet for a minute or two and spoon sauce over chicken when serving. Sometimes I use garlic paste to save time. You can dredge the chicken and then freeze them in a freezer-safe container until ready to use. Make a cheaper version with chicken tenders, it may not save you time, but will likely save you money. Can you believe it is June already? It is such an exciting time of year and Summer will be here before you know it. We had some nice sunny days at the beach this weekend and being near the water is my happy place. Chicken is the only meat that my WHOLE family agrees on, so I can not wait to make this for them. They are all going to love this. I am always looking for new ways with chicken. Might have to take the capers off for my husband but other will love it. Chicken is our default meat and we’re always looking for new recipes. This looks like the perfect weeknight meal! I think it will go well with a side of salad too. We eat a ton of chicken in my family, and this recipe looks so good! You aren’t kidding with the name, easy chicken piccata looks like a delicious and super simply dish to make one night for dinner. Thanks for sharing this recipe so that I can make it up for the family! What a simple and flavorful chicken recipe? Pairing it with the light noodles seems like the perfect idea. I make chicken picatta all the time but with thin chicken and no capers. Hubby doesn’t like capers. I make it almost exactly the same way since discovering the Martha Stewart recipe. Yes, it still tastes great without the capers! When a recipe has the word EASY in it, I’m all ears. This Easy Chicken Piccata looks really tasty. I’m a chicken fan all the way. Thanks for sharing this. This is one of my oldest favorite recipes for dinner. Yours looks so good! I’d rather serve it with noodles! I love an easy meal, especially with chicken because it’s something all my kids will eat. Going to give this a try soon and I will enjoy the leftovers if the kids don’t like it! 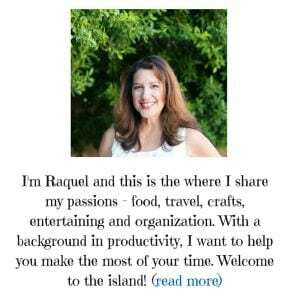 My favorite cooking dish involves chicken and I’m always looking for great recipes. This recipe is easy to follow and I’m down with it. I like that it goes well with the pasta. 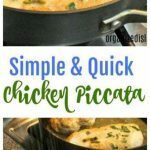 I have actually been on the hunt for a simple chicken piccata recipe – this is perfect! Thank you so much! While we do eat a lot of chicken, I have never made a dish with capers. I am going to do just that this week with this eye-appealing recipe. Thanks for your sweet comment – hope you like it! Yum! I never had chicken piccata before. That does look good. I need to try making this at out next family Sunday dinner. Thanks I think you will love it Marielle! Thank you for the pin Carrie! I’m all in for easy and quick recipes. I think my son will enjoy this dish! Definitely gonna try this weekend. Thanks Bonnie! Hope you love it!